Remember back when you were a kid, sitting on the side of a river or pond on a warm summer day and watching water boatmen bugs glide across its surface? Good days, huh? Well, snap out of it. They're over, you're an adult, it's winter and now robots are doing the gliding instead. 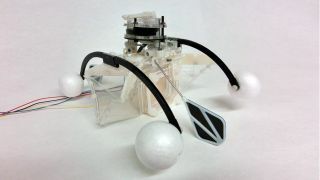 A team of engineers at the Bristol Robotics Laboratory have built a robot that mimics not just how the water boatman moves, but also the way it feasts on dirty pondwater. It's called the "Row-bot", and can operate indefinitely in remote locations by collecting energy from the environment. When it's running low on juice, the Row-bot opens its mouth and scoops some nutrient-rich dirty water into its stomach. That stomach contains a microbial fuel cell, which generates energy from the degradation of organic matter, just like bugs do. A second system, smaller than the first, can feed from chemical energy in the surrounding fluid to start the refuelling process. Jonathan Rossiter, who led the team that built the Row-bot, said: "The work shows a crucial step in the development of autonomous robots capable of long-term self-power. Most robots require re-charging or refuelling, often requiring human involvement." Hemma Philamore, who also worked on the project and co-authored a paper describing the robot, added: "We anticipate that the Row-bot will be used in environmental clean-up operations of contaminants, such as oil spills and harmful algal bloom, and in long term autonomous environmental monitoring of hazardous environments, for example those hit by natural and man-made disasters."